This plaque marks the spot where the body of Pierre-Henri Poutaraud was discovered by French rescue workers. He was one of six men to escape alive from the Laudy barn, only to be shot dead at this spot. There is a photograph in existence (not shown on this website) showing his body lying slumped against a wire fence (no longer here) with a horse tethered to his arm. This location is in the lane leading from the Champ de Foire (to the left) to the cemetery: see photograph of the lane for more detail. 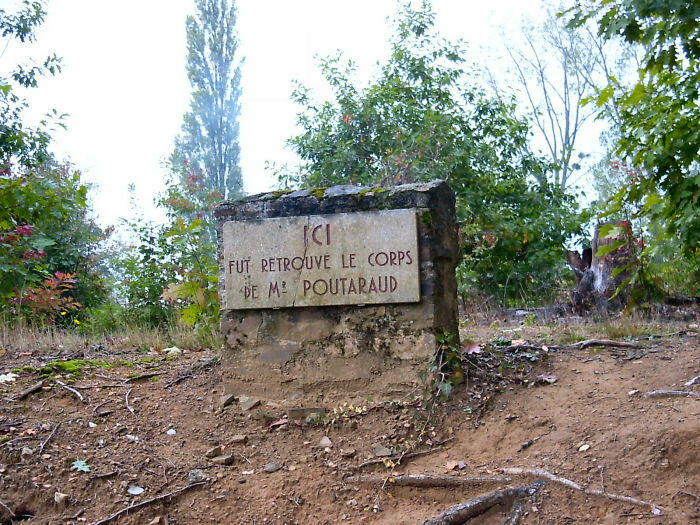 The inscription reads, "The body of M. Poutaraud was recovered here".